The 1975 thriller "Jaws" put Steven Spielberg on the map in Hollywood as a top filmmaker. (CNN) -- As unstoppable as the great white shark in "Jaws," Steven Spielberg has been the driving force of Hollywood action and adventure movies since he burst into the mainstream with the 1975 landmark thriller. In his 30-plus years in the business, the curly-haired, bearded director has invented the movie blockbuster, charmed viewers with his personal storytelling style and sent many a swimmer back to the sand dunes. "He is the storyteller of our time," Jeffrey Katzenberg, Spielberg's DreamWorks SKG partner told People magazine. Money and fame do not appear to take precedence in Spielberg's world despite his three Oscars and the billions of dollars his films have made. Rather an interest in science fiction, a need for adventure and an urge to break all the rules seem to drive him. The anticipated summer release "A.I. Artificial Intelligence" aims to captivate audiences through the eyes of the main character, an android who yearns to be something more. Spielberg, 54, shares this futuristic Pinocchio's sense of curiosity and wonderment -- traits that have endeared him and his films to moviegoers. Spielberg was born December 18, 1946, to Leah and Arnold Spielberg in Cincinnati, Ohio. Arnold was an electrical engineer who had an affinity for tinkering with electronics and computers, and Leah was a concert pianist. As a youth, Spielberg latched on to the camera as a way to express himself, making movies with family and friends. Spielberg, who has three younger sisters, grew up primarily in comfortable middle-class homes in Haddonfield, New Jersey, and Scottsdale, Arizona. "Steve was always a wired kid," his father said. "He was nervous energetic, curious, always interested in looking at things." Young Spielberg was zany, but he was also fearful. "I was afraid of small spaces and I was afraid of the tree outside my window, and I had all these phobias," Spielberg said. "I think many kids have those phobias, but I probably had more than most." At 8, Spielberg found an outlet for his emotions when he began playing with his father's 8mm camera. The director recalled finding inspiration in the 1955 Disney movie "Davy Crockett," a story that would lend him his lifelong credo, "Be sure you're right, and then go ahead." "My mom and dad gave me free reign at expressing myself, up to and including torturing all of my sisters, you know, to the point that I did get in trouble for that," Spielberg said. "They were my first audience." Spielberg's mother remembered a childhood incident in which the future filmmaker arranged a doll's head, which he had cut from one of his sister's toys, on a plate with a bed of lettuce and tomato slices. "If I could get them really terrified, it was kind of like having a hit," he laughed, commenting on his antics. "It was like, wow, great affirmation, you know, that I had told a story that had somehow succeeded." In 1957, the Spielbergs moved to Scottsdale, where they were the only Jewish family in the neighborhood. "It's one of those things that I always hate to admit, but I was ashamed of being so different," Spielberg said. "And I was ashamed of my grandfather calling me by my Hebrew name, Schmuel. "And he would also speak in Yiddish," he added. "I think I was just a very insecure kid, and I put a big magnifying glass up to myself and said, 'You know, I'm not as good as anybody else.'" But he was good at making movies. Once the budding director picked up a movie camera, the Spielberg household was never the same. He started writing scripts, complete with special effects, and everyone in the family was assigned a part. Friends also participated. As a teen, Spielberg made a short film about World War II, inspired by stories from his father, who was a radioman on a B-25 bomber during the war. "And some of the mothers were very upset with us," Spielberg's mother said. "One mother said, 'I just don't like my child always out in the desert and he doesn't do his homework.' Now, I think they are very excited that they were doing a Steven Spielberg film." At 16, Spielberg began work on what would be his biggest project at that point. He wrote and directed the 140-minute film "Firelight," the story of a team of scientists investigating mysterious lights in the sky. Spielberg's father rented out a local theater. The film showed for one night, and his sisters and mother sold popcorn and sodas. The evening was the first of many Spielberg success stories at the box office. 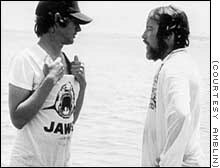 The director, left, talks with star Richard Dreyfuss on the set of "Jaws." While still in college, the boy who had loved terrifying his sisters had landed a contract with Universal Television Studios. At 24, he directed the acclaimed TV movie "Duel" (1971). Then in 1974, Spielberg dazzled critics with his feature film debut, "The Sugarland Express." But nothing had prepared him for the success that a sharp-toothed mechanical shark named Bruce would bring. "Jaws" became the first movie in history to gross more than $100 million. Success from the film started a chain reaction of blockbuster films that relied on suspense, adventure and special effects. Actor Richard Dreyfuss, who played the nerdy shark expert Dr. Matt Hooper in "Jaws," told People magazine he was "scared to death" the first time he saw the movie. "It was like the cultural phenomenon of the early '70s," Dreyfuss told CNN. "Everyone was saying, 'Show me' and within five minutes of the film's beginning, he showed them. In that first scene, whap!" 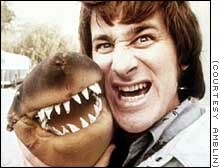 Making "Jaws" tested Spielberg in every possible way. The shooting schedule increased from 55 days to 155, and the budget doubled. "Steven would get so depressed sometimes because the (mechanical) shark wouldn't work," producer David Brown told People magazine. "Of course, in the end that worked to our advantage. We couldn't use the shark, so we had to rely on people's imaginations." In 1977, Spielberg reached audiences again with "Close Encounters of the Third Kind." The film earned him his first Oscar nomination and a meeting with his future wife. Actress Amy Irving auditioned for a part in the film but didn't make the cut. Shortly after, the two began a relationship that would last 13 years. They married in 1985 and had a son, Max. The couple later divorced amicably in 1989. Spielberg's next blockbuster was the suggestion of close friend and fellow moviemaker George Lucas. 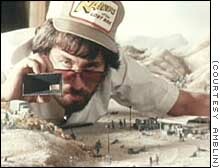 The filmmaker eyes a model of a desert set for the 1981 hit "Raiders of the Lost Ark." "Raiders of the Lost Ark" hit theaters in 1981. Its success prompted Spielberg to direct two more "Indiana Jones" films about the archaeologist-adventurer. During the making of "Indiana Jones and the Temple of Doom" (1984), Spielberg met his second wife, actress Kate Capshaw. The two married in 1991. Their partnership was so important, that when Spielberg pondered starting film studio DreamWorks SKG, Capshaw had a say in his schedule. Partner Katzenberg recalled, "She turned to me and she said, 'So here are my ground rules. ... You can have him after he takes the kids to school and you deliver him back here to have dinner with them at night." The lonely dinners of Spielberg's own childhood were immortalized in the classic "E.T." "I always felt alone for some reason. My mom had her agenda, my dad his, my sisters theirs," Spielberg said. " 'E.T.,' which certainly defines loneliness from my own perspective, is a lot about how I felt about my mom and dad when they finally got a divorce." In addition to incorporating private emotions into his work, the director is also famous for looking through the camera with the eyes of a child, an ability he displayed in "Jurassic Park," the 1993 fantasy film about dinosaurs. Also in 1993, Spielberg made an abrupt departure from the world of make-believe to conquer a more serious saga, one also influenced by childhood experiences. As a boy in Cincinnati, Spielberg recalled his grandmother teaching English to Holocaust survivors. "Our house was filled with survivors with numbers on their forearms," the director told People magazine. "I can remember a man teaching me how to count by the numbers tattooed on his arm." These memories would help fuel the making of his next film, an adaptation of Thomas Keneally's best seller about an industrialist and war profiteer who comes to the aid of Polish Jews during World War II. "'Schindler's List' changed my life completely," Spielberg said. The film would be one of his most serious works since the 1985 adaptation of Alice Walker's "The Color Purple," starring Whoopi Goldberg and Danny Glover. He said he threw away his director's toolbox and started from scratch. He filmed in black and white, used a handheld camera and threw out his storyboards. Spielberg didn't expect the film, which grossed $321 million worldwide, to make any money. It also won him two Oscars, one for best director and another for best picture. Profits from the movie go to charity projects such as the Shoah Visual History Foundation, which allows Holocaust survivors to chronicle their stories. Former MCA/Universal executive Sid Sheinberg gave Spielberg the book. 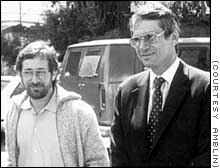 Spielberg, left, with movie exec Sid Sheinberg in 1984. Sheinberg gave the director the book "Schindler's List." "There were many in the Hollywood community who were rooting against him," Sheinberg said. "I think the subconscious reaction is, if a man has been so successful financially and so successful becoming a pop hero, do the movie gods really need to also make him so successful as a creative genius in filmmaking? "And people no longer raise that question. I don't hear anybody wondering today whether Steven can make any kind of picture." Five years after "Schindler's List," Spielberg took on another World War II project, this time the story of D-Day, the Allies' invasion of Europe. "Saving Private Ryan" is a movie that Spielberg said he wanted to make for his father. "It makes me very proud of Steven that he could take, with no war experience himself, and put together a story as powerful and strong and as realistic as that movie. (It) is a real credit to him," Arnold Spielberg said. When Spielberg won the best director Oscar for "Ryan," he singled out his father to thank during his acceptance speech. Spielberg is a devoted father himself. His and Capshaw's family has grown to include seven children. "I think the most important thing that I've gotten from the attention to my films and I guess to myself ... is the fact that my kids respect me," Spielberg said. When asked what his kids like best, Spielberg said it isn't the serious works, but those of pure entertainment. "Shrek," the latest DreamWorks hit, earned $42 million its first weekend at the box office. Spielberg's summer release, "A.I. Artifical Intelligence," is another adventure story for kids of all ages. But in the midst of the fantasy world of film, reality can often intrude. Spielberg checked into a Los Angeles hospital last spring to have one of his kidneys removed because of "an irregularity." A spokesman said he recovered well and that no follow-up treatment would be necessary. In April, he announced he was leaving his post on the advisory board of the Boy Scouts of America. He said he could no longer associate with a group that engages in discrimination, an apparent reference to the organization's exclusion of gays. 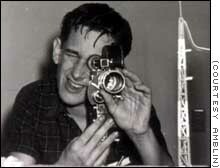 Ironically, Spielberg's first film glory came at age 12, when he showed his fellow Boy Scouts an 8mm movie he had made. Now his own story has come full circle. The boy who was nervous growing up is arguably the world's most successful filmmaker, but he's still not without worries. "I still have pretty much the same fears I had growing up," the director said. "I've carried them with me right through my life until now. And I'm not sure I want to give those up because I think a lot of those insecurities are fuel for the stories that I tell." And as long as Spielberg tells stories, the world will likely want to sit and watch.